(Nanowerk News) One of the biggest temptations facing a scientist is to try and reproduce natural phenomena which are so fascinating given their effectiveness and perfection. 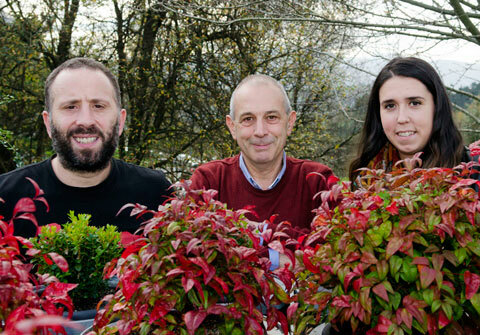 This is the aim being pursued by the UPV/EHU's Molecular Spectroscopy Group which, coinciding with the International Year of Light, has designed a set of fluorescent nanomaterials which have taken their inspiration from the antenna systems of plants. These new multifunctional materials aim to imitate the photosynthetic organisms of plants. These microorganisms consist of thousands of chlorophyll molecules embedded in a protein matrix, which provides them with a specific orientation/arrangement and intermolecular distance. One of the main characteristics of these systems is their antenna function, which enables them to harvest solar energy in a broad spectral range and transport it by means of multiple, efficient energy transfer processes to a specific reaction centre, where it is finally turned into chemical energy. Jorge Bañuelos, Iñigo López Arbeloa, and Leire Gartzia. It is a well-known fact that solar radiation is made up of many colours (blue, green, yellow, red, etc. ), as borne out by the broad range of colours present in the rainbow. The aim of artificial antenna systems is to capture the greatest light range possible so that it can then be efficiently turned into electrical energy (activating of photovoltaic cells)or the emitting of red light, so useful in photonic applications, such as those of biomedical interest. In this respect, and with the aim of coming up with artificial antenna systems, the Molecular Spectroscopy Group has been developing new dyes and photoactive nanomaterials capable of absorbing a broad interval of chromatic radiation which can then be transformed into a red-only emission. Energy donor and acceptor molecules coexist in these photoactive dyes and nanomaterials developed by the Molecular Spectroscopy Group. The former are highly photostable fluorescent molecules and are responsible for absorbing the light which they then transfer to the acceptor species, which will emit light. This strategy allows the limitations inherent in the red dyes to be reduced; these red dyes are characterised by their reduced light absorption and their low photostability and offer a great advantage in photonic and biophotonic applications as they allow the photostability of the system and detection sensitivity to be improved. Three different alternatives have been chosen to develop these antenna systems: two of them are based on the encapsulation of fluorescent dyes in either inorganic or organic hosts, and the other one in the assembly of different dyes into a single molecular structure. “We have replaced the protein matrix of the natural systems by synthetic hosts of nanometric dimensions which protect the dyes and provide a significant arrangement that will help to make the energy transfer processes viable and efficient. Furthermore, with respect to the photoactive part, which is responsible for interacting with the light, the chlorophyll molecules have been replaced by fluorescent molecules many of which have been tuned à la carte,” explained Leire Gartzia, author of the thesis the most salient results of which have been included in the paper published in International Reviews in Physical Chemistry ("Excitation energy transfer in artificial antennas: from photoactive materials to molecular assemblies"). In the first of the alternatives, the solid matrix chosen to encapsulate the fluorescent dyes is of crystalline aluminosilicate known as Zeolite L., characterised by the fact that it has unidimensional channels and a suitable pore size (7Å) in which the molecules fit like a glove. “This produces a highly ordered nanomaterial that allows the light emission to be modulated to produce a red or white light depending on the control we exert on the efficiency of the energy transfer process,” added the researcher. This chameleon-like property turns them into materials capable of generating new light emitting diodes (LEDs), featuring white-light emitting diodes (WLED), which are so useful in lighting technologies such as liquid crystal displays (LCD). The other matrix chosen to host dyes consists of polymer nanoparticles capable of hosting inside them extremely high dye concentrations without it becoming aggregated. “Confining the dyes reduces the photodegradation processes, considerably increases their useful service life and encourages the transfer of energy, which has enabled us not only to obtain an antenna system but also tunable red laser radiation that is efficient and long-lasting in stable aqueous suspensions,” pointed out Leire Gartzia. Finally, they have developed antenna systems made up solely of organic molecules in which the energy donor and acceptor species are linked by a spacer ensuring short intermolecular distances, thus achieving efficiencies in the energy transfer processes of practically 100%. This has meant a great improvement in the harvesting of light across the visible spectrum, leading to exclusively stable bright red which means they are highly recommended as active hosts for tunable lasers in the zone close to the infrared. The main interest in this wavelength is its great tissue penetration capacity, a key in photodynamic therapy with uses in ophthalmology and dermatology and in cancer treatment, for example.